You have fitted your notebook with an SSD disk and given it an enormous power push. And even though Windows 7 off ers special SSD support, the Solid State Disk keeps slowing down. 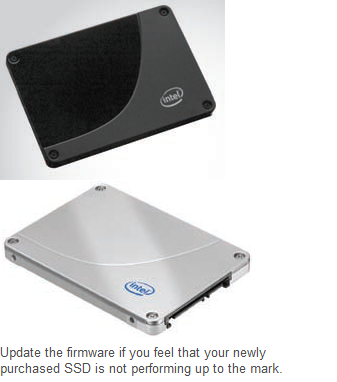 It does seem very run-of-the-mill but a firmware update can really solve all your SSD problems. The focal question when it comes to the write speed of SSD or fl ash disks is whether the fl ash cell that needs to be described is empty. If not, it has to be deleted first and that needs a lot of time. Windows 7 is the fi rst OS that identifi es SSDs and empties unused fl ash cells in the background, if no others are available. The prerequisite for this is that the SSD has to support the trim command. This is usually the case with current models. But if you jumped on to the SSD bandwagon early, you need a firmware update. All manufacturers provide updates and you can download these from their websites. The upgrade itself is child’s play. The latest generation of Intel SSDs is an exception. In these disks, changing the firmware is not limited to the trim command but it also dramatically increases the write speed by almost 100 percent. Unfortunately, this performance has to be paid off with an equally dramatic deterioration of access times. Since a change in access times is more obvious, at least Intel SSD owners who do not have Window 7 need to consider whether they actually want to opt for an update or just a ‘manual’ clearing of the disk from time to time. That way quick access times remain untouched.